Clogau walked away with two gongs at last night’s UK Jewellery Awards, held at the Pavilion at the Tower of London. The Welsh jewellery brand, which was also headline sponsor of this year’s event, scooped the coveted Jewellery Brand of the Year accolade as well as walking away with the Bridal Collection of the Year award for its Clogau Compose range of engagement and wedding rings. Other winners included Hugh Rice Jewellers which took home the Independent Retailer of the Year award while wedding ring manufacturer Brown & Newirth was awarded the Supplier of the Year title. Another wedding ring manufacturer, Hockley Mint won the Employer of the Year Award for its commitment to apprenticeships while this year’s new, Innovation Award went to manufacturer and supplier Cookson Gold for its Direct Metal Laser Sintering technology. Citizen was awarded Watch Brand of the Year while the Watch Retailer of the Year award went to Watchfinder. Gemporia scooped the Etailer of the Year category while Silver Tree Jewellery and Victoria Highfield Jewellers took home the gongs for Branded Jewellery Retailer of the Year and Bridal Jewellery Retailer of the Year, respectively. Freedom at Topshop was awarded the accolade for Department Store/High Street Fashion Jewellery Retailer of the Year and, in another new category for this year, Pippa Small Jewellery was awarded Ethical Jewellery Business of the Year. V Jewellery took home the Brand to Watch award while independent retailer Mococo was given the prize for Best Store Environment. Ornella Ianuzzi, this year’s winner of the Goldsmith’s Craft & Design Award took home the Jewellery Designer of the Year award while former IJL Kick Starter Rosie Sanders won New Designer of the Year. The prestigious Outstanding Contribution to the Industry Award went to London Diamond Bourse president Harry Levy who was recognised for his 50 plus-year career in the industry which has included numerous prestigious positions of office as well as the setting up of his own gemstone business. Almost 700 guests attended the event which was hailed as a great success. 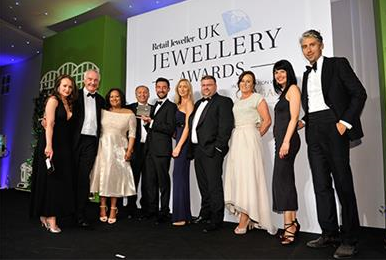 Commenting on the event, Retail Jeweller editor Ruth Faulkner said: “The UK Jewellery Awards remains the only awards for the industry, judged by the industry and competition this year was extremely tough with a record number of entries received.